Fourth in a series of articles by Bill Campbell, retired HSE Group Auditor, Shell International, about safety issues relating to the Shell Prelude FLNG project. It’s an old saying but it is one that is clearly understood, drop the basket and all may be lost. FLNG as a concept is not cheap, on the contrary, but what makes it economically attractive is that you have a reusable functional asset, a very large vessel, which being portable, can disconnect from its seabed anchor system when the field is depleted and relocate to begin all over again in another offshore gas field along with the redeployment of its seabed anchor system. No ongoing costs related to recovering pipelines, abandoning a fixed offshore installation, or removing plant and returning many acres onshore to the condition it was in prior to the construction of the onshore plant. But to return to the title, by some miracle of modern engineering, on the largest ship hull ever assembled, it needs to be large to cram everything in to what is still a very confined space, one functional asset is in turn a shipping terminal, a storage facility for huge amounts of hydrocarbons, a hazardous substances plant producing LNG and LPG, a wellhead and gas treatment plant, an airport, and a hotel housing over a hundred persons. Although LNG is not toxic, it is classified as a hazardous substance by international convention because it is cryogenic, and also produces large flammable vapour clouds in the atmosphere if it is released when evaporating back into its natural state as methane gas. So the risks, if something goes badly wrong, are not distributed, no hedging of bets on this horse.The factors that make this project, not only revolutionary but economically attractive, also make it an act of faith, that it will be all right on the night, nothing hopefully will go wrong because the consequences if it does are too awful to contemplate. Perhaps that is why Prelude is likely to be self insured. 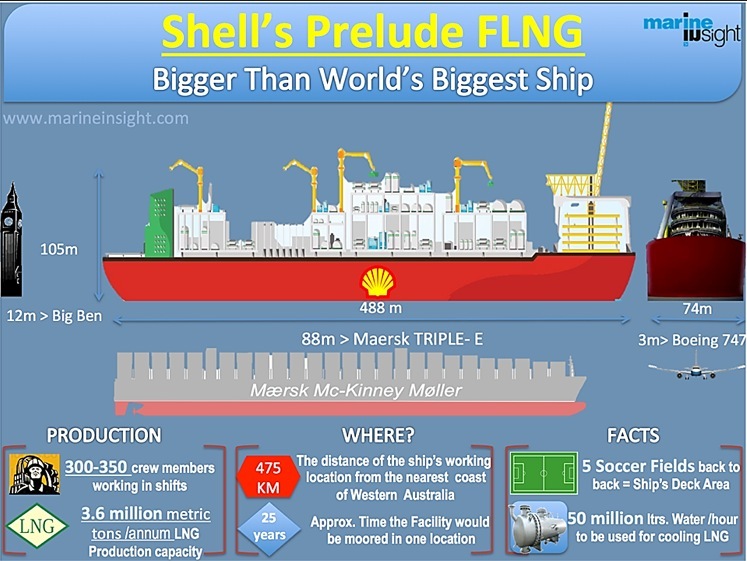 Is Prelude FLNG inherently unsafe? An explanation was given in previous articles that in approving the FLNG option Shell were ignoring conventional wisdom with respect to how a modern hazardous substances plant is designed and constructed, not only to reduce the risks to workers within the plant fence, but also to communities in the locality. One of the main requirements Shell would be have to adopt if building an LNG plant onshore in Europe is the Seveso directive named after the event in Italy some years ago when Dioxin was released into the atmosphere. Shell would be required to produce a Safety Plan which encompasses not only plant safety, but the safety of the public in communities that may be threatened should something go badly wrong at the plant, for example, these communities, where sources of ignition are likely to be ever present, may be downwind of flammable vapour clouds released from the plant and must therefore be separated from the plant by adequate distance. A key component of such a plan would be an explanation by the Operator of how they were to ensure the inherent safety of the plant, it’s employees and the general public. If the same standard was applied to a floating LNG plant with over a 100 workers permanently present then it could not meet the EU Seveso directive because it is not inherently safe in that there is clearly a safer option of installing the plant onshore geographically displaced from local communities putting the public at near negligible risk. The LNG industry accepts that the greatest risk of FLNG is the many times higher potential loss of life because you have a large captive population resident within the plant boundaries, and on the moored vessel alongside, in many ways they are the local community. In this regard we also have to consider the crew of the Carrier vessel, moored tightly to the side of Prelude. By definition simultaneous operations under a Safety Case consider not only the risks imposed on this vessel from operations on Prelude, but vice versa, the risks to Prelude from operations on the Carrier vessel, so the risks of such simultaneous operations can in many regards be cumulative specifically the potential loss of life. The fact that this hazardous substances plant is on a ship, moored on the high seas, is a decision made by the Royal Dutch Shell Board on economic grounds but in the case of the development of this gas field nobody disputes that it would still have been reasonably practicable to have located the plant onshore with it still being an economically viable venture. Hope as they say springs eternal, so hopefully Prelude will have a long and major incident free life. But, and it’s a big but, in the event of some catastrophe the Company would be open to the accusation that it ignored design conventions adopted as a result of the learnings from previous calamitous events worldwide and willingly accepted an option for development which, when compared to current EU and UK directives and standards, in essence ignores those standards, making the FLNG option inherently unsafe. The question to the Board post such an event would be why did you accept a development option FLNG when you were fully aware that the risks to your employees offshore we’re not as low as reasonably practicable? And why therefore did you make financial interests a priority for this project over the health and safety of your employees when you had a choice to do otherwise? Posted in: Bill Campbell, Environment, Gas, GoogleNews, John Donovan, Prelude FLNG Project, Royal Dutch Shell Plc, Shell, Shell Employee Safety.